A logical and regular arrangement among the separate components or elements of a group; a unity of idea, feeling and form. in architecture, an assemblage based on the artistic reworking of post-and-lintel construction and having a specific composition, form, and proportion of elements. Various orders have been used in the architecture of many peoples since early antiquity (for example, in ancient Egypt and Iran). The classical Doric, Ionic, and Corinthian orders, which arose in ancient Greece and underwent some evolution in ancient Rome, were important in the development of European architecture. Archaeological evidence does not support the inference, widespread in world architectural scholarship, that the Greek orders arose as a result of tradition-oriented architects gradually transferring from wood to stone construction. It also does not support the belief that the classical orders reached the zenith of their development in the fifth century B.C., having acquired perfect, “canonical” proportions at that time. Soviet scholars have advanced the theory that the basic orders—the Doric and Ionic (an early variant without a frieze)—appeared as an integrated compositional system in the earliest stone temples and other public buildings. Even at this time the basic orders are thought to have constituted a consciously generalized, artistically conventionalized distillation of wooden Doric and Ionic architecture. The prototype for the Doric order was a structure with a flat ceiling made of wooden beams and a double-pitched roof covered with straw or reeds (later, tiles). The prototype for the Ionic order was a structure with a flat roof consisting of a dense matting of twigs or small logs covered with earth. 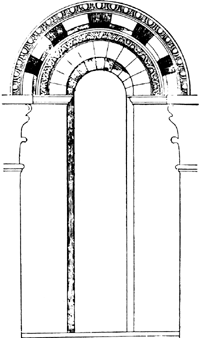 The severe and monumental Doric order, which appeared in the early sixth century B.C., consists of a three-stepped base, or stereobate; a fluted supporting column (usually with entasis) topped by a capital consisting of an abacus and echinus; and the supported entablature, consisting of an architrave, a frieze with alternating triglyphs and metopes, and a cornice. The cornice consists of supporting beams, a horizontal cushion embellished below with mutules (representations of the ends of beams, complete with knobs, or guttae, depicting bronze nails on the underside) and a crowning cymatium (a gutter, with spillways that are often in the shape of lions’ heads) or antefixes. The more elegant and decorative Ionic order, with its greater number of elements, appeared around the mid-sixth century B.C. The column has a round base of complex profile, deep flutes with fillets between them, a capital with volutes covering the echinus, and a thin, square abacus. The entablature has an architrave divided into three horizontal bands, or fasciae, and a cornice with dentils below the bed molding and a carved cymatium above. The Attic variant of the Ionic order first appeared around 525 B.C. in the treasuries built in Delphi by the Ionic cities and developed further in Athens in the fifth century B.C. It combines elements from both the Doric and Ionic orders. In place of dentils, there is a solid frieze, often embellished with relief. Examples of this variant of the Ionic order in Athens are the temple of Athena Apteros and the northern portico of the Erechtheum. Other variants appeared in the fourth century B.C. and later. Certain elements of early origin lost their meaning and were used purely as ornament (for example, the combination of dentils with a plain or triglyphed frieze). The Corinthian order is similar to the Ionic except that its bell-shaped capital is embellished with stylized acanthus leaves. The clear differentiation of an order into supporting and supported elements, with massing expressive of this differentiation, made the system of orders a flexible artistic language for classical architecture by the mid-fifth century B.C. In contrast to the impressive but somewhat monotonous and austere monumental temples of the archaic period, classical structures possessed more variety. A general tendency toward greater symmetry and lightening of the orders may be observed in the transition from the archaic to the classical and Hellenistic periods. The relationships among various components of the orders never attained a rigid, canonical form in ancient Greece, contrary to the opinion of some architectural theorists from the Hellenistic period to the present day. In practice, architects were keenly aware that extremely small changes in the relationships among the elements of an order could impart both to the order and to the building as a whole different feelings of scale and mood, ranging from great power to light elegance. This flexibility and the possibility of using orders in various (including emphatically artificial) ways in other structural systems (such as walls) explain the individuality of classical Greek structures. It also explains the broad application of orders in different historical periods to solve intellectual and artistic problems entirely different from those of the Greeks (Roman, Renaissance, baroque, and neoclassical architecture). Ancient Rome added the Tuscan and Composite orders. The Tuscan order, a simplified version of the Doric, has an unfluted column, a base, and a plain frieze. The Composite order combines Corinthian capitals with Ionic volutes. In Rome the Corinthian order was distinguished by the complexity of its parts, its lavish carved decoration, and the complexity of the modillions below the cornice slab; the columns were often placed on square pedestals. Also popular in ancient Rome and at later times were multistory arrangements of orders on walls, using half columns and pilasters (a practice begun in Greece). The use of orders or elements of orders in combination with vault and arch constructions also spread. This combination is seen in the Colosseum, in Roman basilicas and rotundas, and in Renaissance arched colonnades. The nonfunctional role of order motifs on walls was emphasized in various ways, such as separation of the entablature from the supporting parts. Beginning in the 15th century, the order became one of the most important components in Western European architecture. It first became popular in Russian architecture in the late 17th century. In their discussions of the classical orders, Vitruvius, Alberti, Vignola, and a number of writers of the 16th through 18th centuries principally described the various components and sought to define canonical proportions. Their definitions contradict one another and the historical experience of architecture. During the 19th century, European architectural academies applied a dogmatic understanding of orders to their pseudoclassical eclecticism. This dogmatism helped reinforce the view of architecture as an art subject to extra-historical laws of beauty and hence encouraged the search for an equivalent of absolute beauty in unchanging mathematical proportions. In the 20th century, the use of orders has been primarily for decorative purposes and has been associated with neoclassical architectural tendencies. Alberti, L. B. Desiat’knig o zodchestve, vols. 1–2. Moscow, -1937. Mikhailovskii, I. B. Teoriia klassicheskikh arkhitekturnykh form, 3rd ed. Moscow, 1944. Mikhailov, B. P. Vitruvii i Ellada. Moscow, 1967. Markuzon, V. F. “Arkhitekturnye ordera: Proiskhozhdenie ordera.” In Vseobshchaia istoriia arkhitektury, vol. 2. Moscow, 1973. Pages 33–52. Summerson, J. The Classical Language of Architecture. London, 1963.
an insignia or an honorary state award for special service. The origin of orders as insignia is connected with the orders of religious or secular knights that arose in Western Europe in the 12th century and that were modeled after the monastic orders. Military-monastic knightly associations arose in Palestine during the Crusades (the Order of the Knights of St. John, the Order of Knights Templars, and the Teutonic Order) and in Spain and Portugal during the struggle with the Arabs (the Calatrava and Alcántara orders). In the 13th and 14th centuries the number of knightly orders greatly increased in Western Europe, and some of them had tens of thousands of knights and huge land holdings (such as the Brothers of the Sword and the Livonian and Teutonic orders, which originated in the 13th century during the German aggression in the Baltic). These orders were originally military and religious organizations subject to the pope; the members of the orders took monastic vows. Later, most orders came under the authority of various monarchs, who themselves instituted new knightly orders (for instance, the Danish Order of Danebrog in 1219 and the Swedish Order of the Seraphim in 1280). Members of the orders wore distinctive clothing on which crosses of specified shapes and colors were sewn. In the 14th, 15th, and 16th centuries there was a great proliferation of court orders, which were established by monarchs for the encouragement of the nobility and gentry. Members of these orders also wore splendid order costumes and special order insignia. These insignia were later bestowed as awards, such as the English Order of the Garter (1348 or 1350) and the Order of the Bath (1399), the Burgundian, and later, Austrian and Spanish Order of the Golden Fleece (1429), and the French Order of the Holy Ghost (1579). An especially large number of award orders were established in the 18th and 19th centuries. Many orders were founded in countries that had never had orders before, including some Asian countries. Thus, Turkey instituted the Order of the Crescent in 1799, Iran the Order of the Lion and the Sun in 1808, Japan the Order of the Rising Sun in 1875, and China the Order of the Double Dragon in 1882. An order usually consisted of a sign (cross, star, etc.) worn on a ribbon or a chain and a broad ribbon of a specified color worn over the shoulder (for the higher classes of the order). Each order could have one or more classes. The orders were placed in a system of seniority with respect to each other. The rules, or statutes, regulating the awarding of orders provided for order holidays and ceremonies. In some cases the award of an order entailed the granting of hereditary or personal nobility and other privileges. In Russia the first orders were instituted by Peter I: the Order of the Holy Apostle Andrew Protoklitos (1698), which was the highest award, and the female Order of the Holy Martyr Catherine (1714). These were followed by the Order of St. Alexander Nevsky (1725) and the Order of the Holy Martyr and Victor George (1769), established as an award to officers and generals for military distinction. In 1782 the Order of Holy Prince Vladimir Isapostolos was established (the order fourth class was awarded for length of state service). In 1797 the Schleswig-Holstein Order of St. Anna became a Russian order; the order third class, and from 1815 also fourth class—a cross worn on the hilt of a sword or saber—was awarded only to officers for bravery. The soldiers’ Badge of Distinction of the Military Order was instituted in 1807 and renamed the Cross of St. George in 1913. Orders first class were usually worn over the shoulder on a ribbon of a color established for the particular order (for instance, an azure ribbon for the Order of Andrew Protoklitos and a red ribbon for the Order of Alexander Nevsky). Orders of the other classes were worn on a ribbon around the neck, and orders of the junior classes were worn in the buttonhole or on the hilt of a saber. From 1855 all orders (except the Order of St. George) awarded for military service had a special sign—crossed swords. In 1831 the Polish Order of the White Eagle (1325) and the Order of St. Stanistaw (1765) were made equal to Russian orders. After the October Socialist Revolution of 1917, the All-Russian Central Executive Committee and the Council of People’s Commissars issued on Nov. 10 (23), 1917, the decree On the Abolition of Estates and Civilian Ranks, which also abolished the tsarist orders and medals. Many orders exist in the other European socialist states. Bulgaria has the orders of Georgii Dimitrov, Stara Planina, the People’s Republic of Bulgaria, Madarski Konnik, September 9, 1944, the Rose, People’s Freedom 1941–44, For Bravery, the Red Banner, the Red Banner of Labor, the People’s Order of Labor, For Civilian Valor and Service, Cyril and Methodius, Mother Heroine, and Glory of Motherhood. In the German Democratic Republic there are the orders of Karl Marx, For Service to the Homeland, the Banner of Labor, and the Great Star of Friendship of Peoples. Hungary has the orders of the Banner of the Hungarian People’s Republic, the Hungarian People’s Republic, the Red Banner, the Red Banner of Labor, Labor, the Red Star, and Hungarian Labor. In Poland there are the orders of the Builders of People’s Poland, the Renaissance of Poland, Virtuti Militari, and the Grunwald Cross. Rumania has the orders of the Star of the Rumanian People’s Republic, August 23, the Defense of the Homeland, Labor, For Military Service, Mother Heroine, and Glory of Motherhood. In Czechoslovakia there are the orders of Klement Gottwald: For the Building of the Socialist Homeland, the Republic, Labor, the Red Banner, the Red Star, the Red Banner of Labor, the Red Star of Labor, the White Lion, and Victorious February. Yugoslavia has the orders of the Yugoslav Great Star, Hero of Socialist Labor, People’s Liberation, the Yugoslav Star, the Yugoslav Banner, the Republic, For Service to the People, Labor, Brotherhood and Unity, Freedom, People’s Hero, the Combat Banner, the Partisan Star, the People’s Army, For Military Service, and For Bravery. The best-known orders in the USA are the Purple Heart, the Navy Cross, and the Silver Star. In Great Britain there are the Order of the Garter, the Order of the Bath, the Victoria Cross, the Distinguished Service Order, and the Order of Merit. France has the Order of the Legion of Honor. a written command, injunction, or instruction. Examples of orders include money orders, residence permits, search warrants, and court orders for the seizure of various papers and valuables as material evidence. the mutual arrangement of warships, regulated according to direction and distance, in a sea crossing or during battle. The order is established to defend the battle or cruise formation of the ships against possible attack by aircraft, submarines, torpedo boats, and other enemy surface vessels and also to pass through minefields. The guard ships of the order are placed so that they will detect the enemy in time and thwart the attack with their weapons. Depending on the chief threat, the order may be directed for protection against aviation, submarines, torpedo boats, mines, or nuclear weapons. (in Russian, otriad), in animal classification, a taxonomic category that unites several families. Closely related orders make up a class. In a number of cases, owing to a refinement of the taxonomic system, an order is not ranked directly below a class but below such categories as a superorder, an infraclass, or a subclass. New information about extant and extinct animals and differences in opinion among scientists as to the content and meaning of a system result at times in the reexamination of the size of an order and in the division of obsolete orders. For example, the order Rodentia has been divided into two generally accepted orders, Rodentia and Duplicidentida. In plant taxonomy, the Russian word poriadok is used to designate an order. one of the main taxonomic categories that comprises related plant families. For example, the order Urticales embraces the elm, mulberry, hemp, and nettle families. The Latin name of an order is usually formed by adding the suffix -ales to the root of the family name. An order usually comprises two or more (as many as 20) families. It may, however, include only a single family. For example, the order Salicales has only the single family Salica-ceae. Large orders are sometimes divided into suborders. The number of orders varies from one phylogenetic system to another. For example, one system combines all the families of flowering plants into 94 orders, and another consists of 78 orders. Related orders are combined into classes, whose intermediate categories include superorders and subclasses. The term “order” is also used in animal taxonomy. in mathematics, a numerical characteristic of a mathematical object. (1) The order of an algebraic curve F (x, y) = 0, where F(x, y) is a polynomial in x and y, is the highest degree of the terms in the polynomial. For example, the ellipse x2/a2 + y2/b2 = 1 is a second-order curve, while the lemniscate (x2 + y2)2 = a2(x2 - y2) is a fourth-order curve. In general, α is said to be an infinitesimal of higher order than β if lim α/β = 0 and of lower order than β if lim α/β = ∞. Orders of infinitely large quantities are similarly defined. exists and is a finite nonzero number. (4) The order of a derivative is the number of differentiations that it is necessary to perform on the function in order to obtain that derivative (seeDIFFERENTIAL CALCULUS). For example, y′″ is a third-order derivative and δ4z/δxδy3 is a fourth-order derivative. The order of a differential is similarly defined. (5) The order of a differential equation is the order of the highest derivative that appears in the equation. For example, y′″y′ — (y″)2 = 1 is a third-order equation, while y″ — 3y′ + y = 0 is a second-order equation. (6) The order of a square matrix is the number of rows or columns in it. (7) The order of a finite group is the number of elements in the group. The order of an element α of a group is the smallest positive power n such that an is equal to the identity element of the group; if such an n does not exist, then a is called an element of infinite order. (8) If in some study or computation, all powers of some small quantity have been discarded starting with the (n + 1) st, then the study or computation is said to have been conducted with a precision up to order n. For example, in the study of small-amplitude vibrations of a string, one neglects quantities containing second and higher powers of the deflection and its derivatives, thereby obtaining a linear equation (linearization of the problem). (9) The word “order” is also used in the calculus of finite differences (differences of various orders), in the theory of many special functions (for example, cylindrical functions of nth order), and so forth. (10) In measurements, a quantity is said to be of order 10” if it lies between 0.5 × 10n and 5 × 10n. (prikaz), in the USSR, an administrative document issued by ministers, heads of departments and the divisions and administrations of the executive committees of local soviets, and the directors of enterprises, institutions, and organizations. The right of these top executives to issue orders is provided for by the Constitution of the USSR, the constitutions of the Union and autonomous republics, the statutes of ministries and central boards, and other such documents. In terms of legal nature, an order may be a normative act (ordinarily the orders of ministers and directors of institutions confirm regulations and instructions) or an act involving the application of the law (the appointment of someone to a position or the establishment of plan assignments). In many cases, directors of enterprises can issue orders only with the consent of the factory trade union committee. An order goes into force at the moment of issuance unless otherwise indicated in the order itself. In a combat situation in the armed forces a combat order is given. A classification of chemical reactions, in which the order is described as first, second, third, or higher, according to the number of molecules (one, two, three, or more) which appear to enter into the reaction; decomposition of H2O2 to form water and oxygen is a first-order reaction. A differential equation has order n if the derivatives of a function appear up to the n th derivative. The number of elements contained within a given group. A square matrix with n rows and n columns has order n.
The number of poles a given elliptic function has in a parallelogram region where it repeats its values. A characteristic of infinitesimals used in their comparison. For a polynomial, the largest exponent appearing in the polynomial. The number of vertices of a graph. For a pole of an analytic function, the largest negative power in the function's Laurent expansion about the pole. For a zero point z0 of an analytic function, the integer n such that the function near the pole has the form g (z)(z-z0) n , where g (z) is analytic at z0 and does not vanish there. For an algebraic curve or surface, the degree of its equation. For an algebra, the dimension of the underlying vector space. For a branch point of a Riemann surface, the number of sheets of the surface that join at the branch point, minus one. A range of magnitudes of a quantity (and of all other quantities having the same physical dimensions) extending from some value of the quantity to some small multiple of the quantity (usually 10). Also known as order of magnitude. A taxonomic category ranked below the class and above the family, made up either of families, subfamilies, or suborders. 1. In Classical architecture, an arrangement of a particular style of column together with the entablature (which it supports) and standardized details, including its base and capital. The Greeks developed the Corinthian order, Doric order, and Ionic order; the Romans added the Composite order and Tuscan order. For each order, the height and spacing of the columns is established in terms of a specified number of diameters of the lower part of the columns; the design of the base and capital is also prescribed. The height of the entablatures is determined by the height of the columns. 2. In masonry, one ring of several around an arch.